Matthew Davies studied at the University of Manchester and the London School of Economics where he gained a Masters in Law (LLM) with distinction. Matthew joined Wilson Solicitors LLP as a trainee solicitor in 1990, qualifying as a solicitor in 1992. Matthew became a partner in the firm in 1997. He is now Head of the Immigration Department managing a team of over forty immigration professionals. Since qualification he has practised exclusively in immigration and asylum law. He has 25 years of experience of a wide range of cases at all levels. His particular expertise is finding solutions for individuals with complex immigration problems. 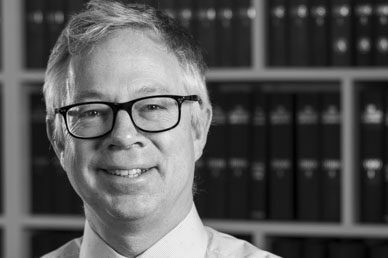 Matthew’s current interests include family and partners, EEA nationals, human rights, citizenship, deportation, asylum, adoption and surrogacy. Whilst primarily advising individuals he also advises investors, entrepreneurs, charities and employers. Matthew has been ranked as a leader in the field of immigration law in the Chambers UK Guide to the Legal Profession for many years. He has been commended for his “well prepared cogent, clear and sensible advice”(2006), as “one of the giants of the immigration field” (2007), his “innovative, intelligent and strategic way of looking at things” (2008), being “likeable, hard-working and realistic in terms of what is achievable” (2013), being “ great on difficult asylum cases and widely rated by peers for the quality of his work” (2014), being “ highly regarded for his advice to clients with complex immigration problems” (2015), and being “an excellent solicitor with a tremendous understanding of clients and the legal context he’s advising them in. The preparation of his cases is second to none” (2017). Matthew has also been recommended in the Legal 500, Best Lawyers, Super Lawyers, and the Spears 500. Matthew is a past executive committee member and trainer for the Immigration Law Practitioners’ Association [ILPA], and has served as a consultant to the Office of the Immigration Services Commissioner. He has been an examiner on the Law Society Immigration Accreditation Scheme and he is an Advanced Member of that scheme. Matthew is a past Chair of INQUEST and the Stonewall Immigration Group. He is a co-founder of the charity UKLGIG. In 1997 he was a recipient of the Stonewall Equality Award for his contribution to the legal fight for gay rights in the UK. Matthew is the co-author of a number of published texts including the Best Practice Guide to Fast-Track Asylum Cases for ILPA. He has spoken at numerous conferences and seminars both in the UK and abroad. Matthew supports a number of pro-bono ventures providing free legal advice as a volunteer to UKLGIG, Body and Soul and other organisations. In 2006 Matthew was appointed as an Immigration Judge in the First Tier Tribunal and he sits regularly on a part-time basis. Interests: Running marathons, music, and new ideas.